Chicken, parsley & peppermint oil. Ethical, natural, low-calorie and award-winning. Ethical Award - The Ethical Company Organisation. No added salt or sugar. PETA - not tested on animals. 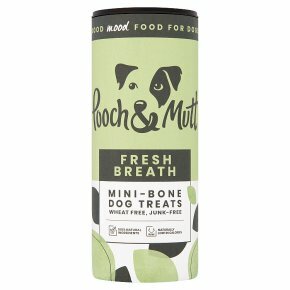 Fresh Breath includes chicken, parsley, peppermint oil and chicory. Parsley is a source of chlorophyll, a natural deodoriser. Peppermint not only gives breath a fresh scent, it can also aid digestion. Poor digestion is often a cause of bad breath. Chicory is a natural prebiotic that can help the functioning of the digestive system. The biscuit's abrasive action can clean your dog's teeth as they chew. <3.3 Calories per treat (treat weight 0.8g) Feed 5-15 treats/ day depending on dog's size Feeding Guide: Feed as a treat/reward. Do not over feed. Clean fresh water must be available at all times. For dogs older than 16 weeks. For canine use only.